Get ready for awe-inspiring, combustible space garbage. A Japanese company called Astro Live Experiences is about to launch a satellite that it will use to generate the first-ever artificial meteor shower. The satellite is an experimental prototype that the company hopes will help it prepare for its first full “Sky Canvas” show near Hiroshima in 2020. It’s loaded with thousands of tiny pellets that will catch fire as they descend through the atmosphere, leaving long, glowing trails that resemble shooting stars, according to CNET. According to the company, each centimeter-wide pellet will combust as it re-enters the atmosphere. From the ground, the plan is that it’ll look like a shooting star that burns brighter and lasts longer than the real thing. Astro Live Experiences claims that the pellets will totally disintegrate, though scientists told BuzzFeed News early last year that there would be some risk of the pellets colliding with other satellites. Risks aside, this prototype and next year’s Sky Canvas show demonstrate that performance art has breached the final frontier. Whether you’re a kid wishing on a star or a young lover enjoying a romantic evening, is there anything more beautiful and awe-inspiring than seeing a tech startup’s space garbage illuminating the night sky? 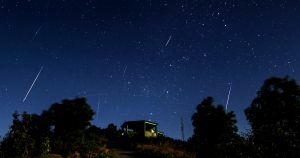 “I hope that our man-made meteors will help reveal new discoveries in science, and that it will gather and entertain people under the night sky,” Astro Live Experiences CEO Lena Okajima said in a recent press release. It’s unclear exactly how a Sky Canvas show will contribute to science, but we decided to fathom a guess. Hypothesis: If a tech startup fills the sky with flammable garbage, a bunch of tech blogs will groan in unison. Those results are good enough to publish. Editor’s Note 1/17 at 5:37 PM ET: This article has been updated to when the satellite will launch.